I thought this was a particularly accessible post in my R Bloggers feed. There's not much discussion if you click through, but I thought the graph was interesting enough to share. 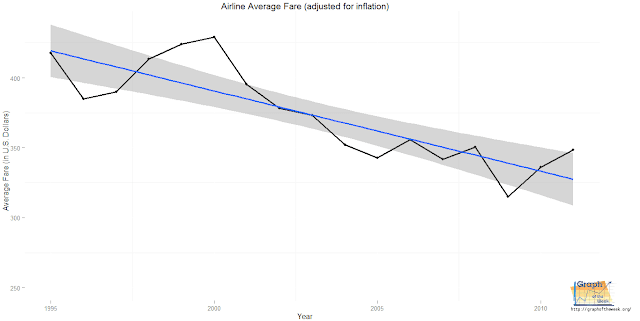 One thought that comes to mind when seeing this graph is whether the type of fares people choose have changed. If people are somehow choosing systematically shorter trips now versus in 1995, this might explain the downward trend. Then again, maybe flying is getting cheaper after all.